If you’ve ever had the opportunity to see glass artists creating their work, you may have heard them use some terms you’d never heard before. Like any other art or craft, the creation of glass art uses many special tools and pieces of equipment, and these things have names that people outside the glass art community aren’t familiar with. 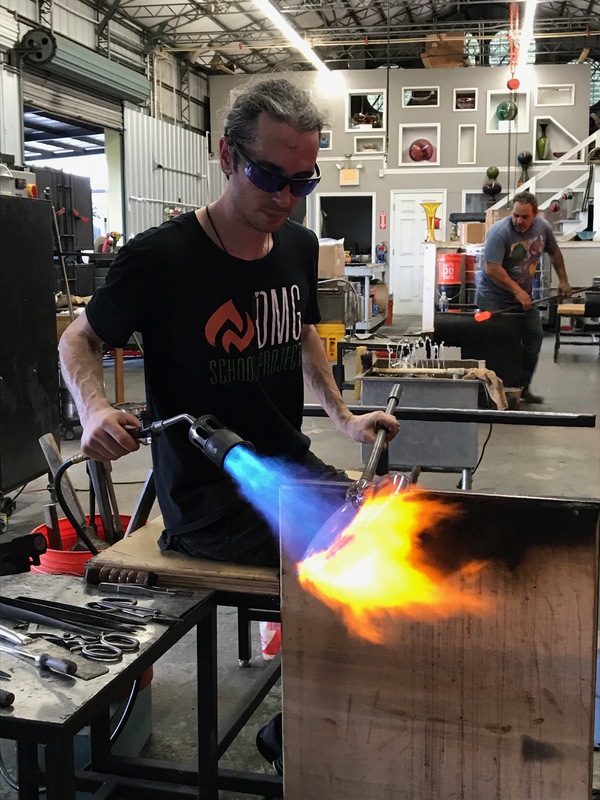 Whether you are planning to attend glassmaking workshop, want to spend some time in the Hot Glass Workshop at the Duncan McClellan Gallery watching artists create their works, or simply want to learn more about how glass art is made, this short guide will introduce you to many of the terms for tools and equipment you’ll encounter. Furnace – The source of heat used to melt and heat glass to workable temperatures. Modern glass furnaces are usually gas powered, and heat to around 2000 degrees Fahrenheit. Annealer – An oven used for annealing, which is the process of slowly cooling and hardening glass after it has been worked by an artist. Glass will crack if it cools too quickly, so an annealer is used to prevent this. Bench – The work station that a glassblower works on, usually with arms that support the blowpipe while the artist rolls it. Block – A wooden, spoon-shaped tool used to shape hot glass. Blow pipe – A hollow metal pipe with a mouthpiece on one end and a built up area on the other end where the molten glass sits. It is used to blow air into molten glass. Glory hole – The opening of the furnace used to keep the glass hot so it is soft and workable during the glassmaking process. Jacks – A tool that looks like a large pair of tweezers, used to manipulate hot glass. Jacks come in many different sizes, for different types of glass working. Marver – A metal table used for adding color and shaping hot glass on a blowpipe. In the past marvers were made from marble slabs, which is where the name comes from. Mold – An object used for shaping molten glass to its form. Optic Mold – A metal mold with notches of various sizes, used for separating color in the glass into lines, or pressing ridged patterns into the glass. Paddles – Wooden tools used to flatten sections of glass, such as the bottom of a piece of the glass art where it will stand. Punty – A metal rod which is tipped with a small gather of hot glass. When a glass piece has been blown to is approximate size, and the work on the bottom of the piece is finished, the punty is attached to the bottom, to hold it while the artist finished working on the top. Yoke – A stand that supports a blowpipe while glass attached to the blowpipe is being reheated in the gloryhole.